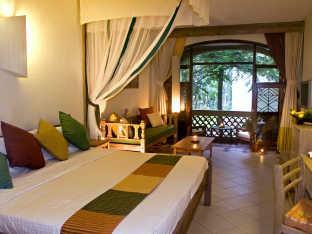 ﻿ Severin Sea Lodge Mombasa. JIMAT di Agoda.com! Ada soalan mengenai Severin Sea Lodge? Terletak di Pantai Bamburi, Severin Sea Lodge merupakan tempat menarik untuk memulakan pengalaman di Mombasa dan kawasan sekitarnya. Hanya sejauh 20 km, hotel 4-bintang ini boleh diakses dengan mudah dari lapangan terbang. Pelawat yang datang ke hotel boleh melawat tarikan utama di bandar ini seperti: Lapangan Terbang Bamburi, Mombasa Marine National Park and Reserve, Mamba Village Centre. Severin Sea Lodge juga menawarkan banyak kemudahan untuk memperkayakan penginapan anda di Mombasa. Untuk keselesaan dan kemudahan tetamu, hotel ini menawarkan Wi-Fi percuma semua bilik, pengemasan harian, khidmat teksi, meja depan 24 jam, fasiliti tetamu kurang upaya. Tetamu boleh memilih dari 188 bilik, semuanya yang akan memberikan suasana ketenangan dan keharmonian. Di samping itu, pihak hotel menawarkan aktiviti rekreasi untuk memastikan anda mempunyai perkara untuk dilakukan sepanjang penginapan anda. Apabila anda mencari penginapan yang selesa dan mudah di Mombasa, ijadikan Severin Sea Lodge sebagai rumah anda seperti berada di rumah sebenar. A fine hotel.. Good location. Very good food & good value. Nicely located by beach front. Rooms and hotel grounds are clean and well maintained. Staff are polite and very helpful. Facilities are great with two pools. Although we only booked Room and breakfast, selection was great and so was the afternoon tea. Evening entertainment was lively! Thank you team Severin and look forward to seeing you again in the future. 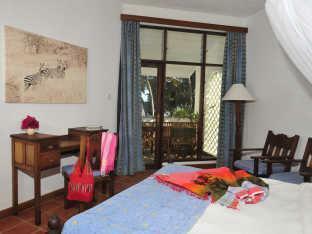 The rooms in the Karibu bungalows where we stayed were not in very good condition. We had to change rooms halfway through our stay because the shower was constantly dripping and the bathroom floor was always wet. In our new room, the air conditioner leaked water but that eventually stopped. However the paint in the bathroom was peeling off... We did not want to move a second time. The other con was that the buffet was ridiculously expensive - as were the à la carte options - and the food was mediocre. However, the staff were superb and the site and grounds were magnificent. Our family had a great time at this resort. Very relaxing, friendly and helpful staff, lots of free activities during the day offered by resort such as pool aerobics, games, group activities. 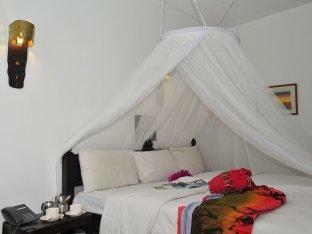 Rooms are very spacious, clean and well decorated. Food is amazing at the restaurants and bars. Overall highly recommended for a pleasant and relaxing holiday stay. 2 main reasons why I found the stay very disappointing First was the very poor follow up and resolution of my complaint for lack of hot water in my room. I made the complaint at 9am and despite numerous follow ups the problem was not resolved until after 7pm. What was galling isthat the reception staff I talked too had no idea about the complaint and each time they had to start over again talking to maintenance. It was only after I threatened to check out tha the Duty Manager intervened and I was moved to another room. Secondly was the so called free internet which is better described as non existent. Other than at reception the hotel wi-fi is patchy takes ages to connect and connection lasts a few minutes. On day 2 of my stay hotel reception staff claimed it was being repaired but it was just as poor by the time I left after a 6 day stay. This is one hotel I won't return to and definitely not one I would recommend. The pools are great. Staff are super friendly and helpful. The location is great since it's next to the beach. I was there during low season so it's quiet and nice. There was a discount during the low season because prices go up during the summer. Would go back! I was volunteering in Kenya and wanted to chill out near the beach on a weekend, however this did not happen! My room backed on to the hotel next door, the music was constant all night! I complained to the management who said they were unable to do anything. This hotel was not cheap and therefore I would have expected more customer service. The beach is not relaxing at all due to the number of beach boys hanging around on the hotels beach. Even whilst sunbathing in the hotel grounds you are hassled by them shouting you. The beach is also extremely disappointing due to the amount of seaweed and the low tide. 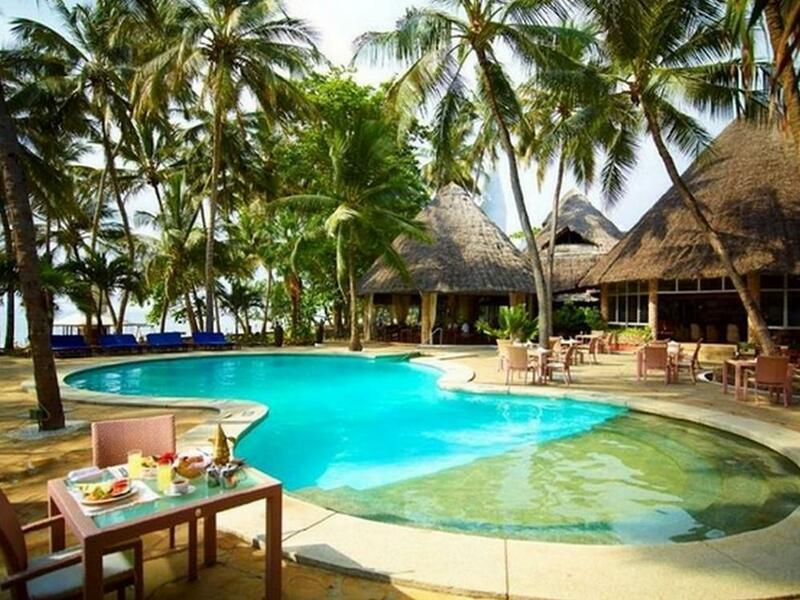 Avoid and make the trip to Diani beach instead as it is a lot nicer. Wonderful location. Great pools and gardens. Staff on the whole could have been a little more friendly. There was dry urine in shower stall of one of our rooms. Also, staff member ordered me to use silver tongs to pick up very dry cake. Cake was falling apart yet he said, "Excuse me, excuse me. Use the tongs, use the tongs". I ignored him as if I didn't understand English. I did not touch any other piece of cake but he thought I had no class. He should have asked if he could assist me in lifting the dry cake to my plate and used the tongs himself. Clean hotel at a very good price. Got upgraded to an amazing beach front room, service was very good and staff friendly, thank you for the few days of luxury I had here. 'Fantastic' is exaggerated for a Swiss traveller. I've travelled to more than 70 countries and have come across 'fantastic' hotels in Asian countries and the USA! 1) Room Service - food can take longer than 1 hour...and you still pay 200KSH for delivery. 2) Some staff to try to help, but they are bound by abroad management (Severin Travel). 3) Main pool bar closed during peak DEC/JAN period - asked a waiter to bring a menu, he did'nt return. asked another - took 30 mins to get a menu. 4) Limited food menu - Wanted a chicken curry, to be told they don't have the ingredients 5) Contacted customer services, who gladly washed there hands off. 6) noway a 4* - in need of much of a refurb, main pool bar area, patio door severely cracked and broken. 7) Wifi - your better off writing a letter to home, coz you will never find connection. Would I stay there again? NO. Customer service, cleanliness and general ambience. On the beach. The food. The service.